Huge, unproductive expenditures need to be redirected to encourage the values and behavior that move people out of poverty. A recent forum on fighting poverty, sponsored by the Jack Kemp Foundation and moderated by House Speaker Paul Ryan and South Carolina Sen. Tim Scott, showed why the Republican Party is America's party of vision. The forum featured six Republican presidential candidates: Jeb Bush, Ben Carson, Chris Christie, John Kasich, Mike Huckabee and Marco Rubio. Each responded to questions from Ryan and Scott and weighed in with their ideas for fighting poverty. They delivered a powerful message — that the most important anti-poverty programs in America are the ideas and values that created the American success-and-prosperity machine from day one. I am talking about freedom, entrepreneurship, education to provide tools for realizing opportunity, and family, which keeps values intact and individuals in control of their lives. Our particular challenges of poverty have really been about bringing what we know works — freedom, tradition and personal responsibility — to the uniquely challenged minority communities in America. This was already starting to happen before liberals took over the poverty issue with President Lyndon Johnson's "War on Poverty" in 1965. In 1959, the black poverty rate was 55.1 percent. By 1969 it was down to 32.2 percent. As Thomas Sowell has written, "In the period from 1954 to 1964 ... the number of blacks in professional, technical, and similar high-level positions more than doubled." Since the launch of the war on poverty and the beginning of massive spending and big government anti-poverty programs, the black poverty rate has hardly moved. Today it stands at 27 percent. What did happen was the collapse of black families after the start of massive government intervention into black life, with a tripling of single-parent black homes since the 1960s. Republican initiatives have pushed back over the years to work against the massive liberal takeover of the poverty issue in America. As former Florida Gov. Jeb Bush points out, "three things will lift people out of poverty: work, marriage, and a high school education, at least." Rather than government takeover of personal lives in poor communities, these individuals need to be empowered so they can truly be free and develop and bring their own skills and abilities to the marketplace. Republican candidates at the Jack Kemp Foundation forum discussed ideas of how to push back toward this direction. We must be looking at programs that reward work, marriage and family life, and maximize opportunities for poor children to get educated. Jack Kemp, back in the 1980s, promoted the idea of enterprise zones, to encourage business development in poor communities. Such ideas as the earned-income tax credit, school choice, welfare-to-work programs and vouchers to provide housing choice are all Republican ideas for bringing the power of freedom to poor Americans. As Speaker Ryan and Sen. Scott recently wrote, we're spending $750 billion annually through more than 80 anti-poverty programs, "yet 46 million Americans are poor today, and the poverty rate has barely budged: from 19 percent in 1965 to 14.8 percent in 2014." These huge, unproductive expenditures need to be redirected to encourage the values and behavior that move people out of poverty. Jeb Bush is proposing taking the funds from the biggest programs — welfare, food stamps and housing assistance programs — and block granting them to states so creative local decisions can be made to use these funds efficiently. The Kemp forum provided an invaluable platform to shine light on powerful conservative ideas that Republicans have been working on for years to empower poor Americans and undo the destruction caused by liberals. We even saw media coverage by liberal outlets such as MSNBC. 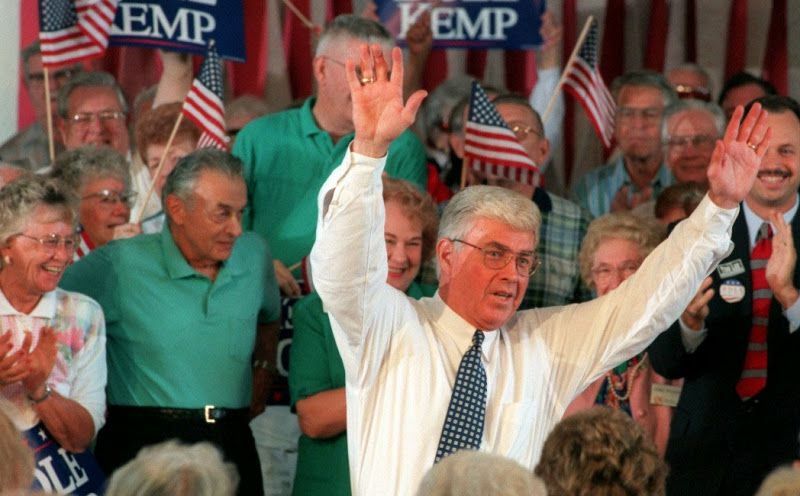 Special kudos to Jimmy Kemp, president of the Jack Kemp Foundation, for carrying on the tradition and great love of America embodied by his late father, my friend Jack Kemp.